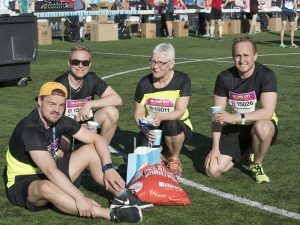 For the first time, Helsinki City Running Day offers a recovery area for the runners of the day. Recovery area is located behind Telia 5G Arena, near the finishing line and equipment storage. The area includes Avantopool Kinos cold recovery pools, sauna provided by Union of Professional Engineers in Finland to celebrate their 100. jubilee year, and possible massage services. Other services of the recovery area are confirmed later in the spring. Avantopool offers a possibility for Helsinki City Running Day participants, to try professional cold recovery. There will be five Avantopool Kinos -cold recovery pools, where the temperature of the water is suitable for effective recovery (+6°C – +9°C). The staff of Avantopool will be on the spot the whole day to give guidance and assist runners concerning cold recovery. Along with cold recovery pools, runners can take a sauna. The sauna is designed and made by engineer students from Kuopio. This sauna is mobile sauna cart, which gives possibility to take a sauna in almost anywhere! Union of Professional Engineers in Finland brings sauna possibility for the runners of Helsinki City Running Day to celebrate their 100. jubilee year. Aim of the recovery area is to serve runners even better than before, and to give a great experience after the run. The runners can wash up at Swimming stadion of Helsinki, and there is also possibility to go to swim to the most popular lido in Helsinki, if the pools are filled by event day. See you in Helsinki City Running Day events on 18.5.2019! 2019 Helsinki City Running Day shirt now on sale!